Strong Snap Button Keeps Your Gun Secure Also for Quick and Silent Draw. The Nylon 6 belt clip ensures your holster stays put when you draw your gun no matter the situation. High Quality Thinnest 3mm Neoprene smooth skin material, 90% polyester and 10% Spandex, Sewing double stitching in nylon thread 150D. Belt Clip in Nylon 6 material. Materials are Softer, Breathable and Quicker to Dry. The Black Scorpion Neoprene Holster is the "inside the waist band" concealed carry holster. 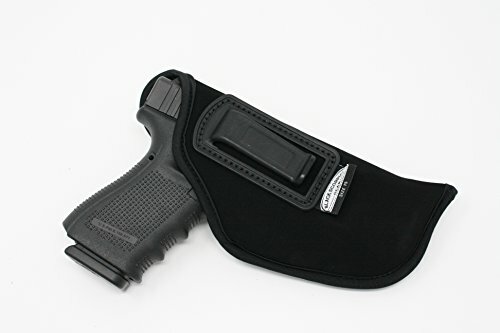 This comfortable, form-fitting holster is built to last, backed by Black Scorpion Gear 2 year Limited Warranty, guaranteeing maximum protection, and letting you enjoy day-in, day-out comfort and performance for as long as you own it. The Black Scorpion Neoprene IWB Holster is designed for optimum concealment and ease of access when most needed. The firearms you carry are indispensable and will be needed at a crucial time. You can't afford to trust a flimsy, undependable holster. Black Scorpion Gear, American company leader in the manufacture of sports shooting equipment USPSA & IDPA . CENTURY ARMS: Canik TP-9SA, TP-95A, Canik TP-9SFx, TP-9SF | H&K: VP 9mm, USP 9mm, USP .45 ACP, USP SD 9mm | TAURUS: PT 809 / 92 / 99 AF, APX 9mm, M9 A3 9mm, PT 809 9mm Full Size, MG2 9mm, 24/7 9mm, PT 845 .45 ACP, 24/7 G2 .45 ACP. Strong Materials and Clip Keeping The Gun Secure Also for Quick and Silent Draw | The Nylon 6 belt clip ensures your holster stays put when you draw your gun no matter the situation | High Quality Thinnest 3mm Neoprene smooth skin material, 90% polyester and 10% Spandex. Sewing double stitching in nylon thread 150D. | Belt Clip in Nylon 6 material. | Materials Softer, Breathable and Quicker to Dry | Strong and Durable Click and Retention System | Color: Black |  Satisfaction Guaranteed.